A MAD FLAVOR SCIENTIST OF LOCALLY DISTILLED SPIRITS. Part of the Wisconsin Science Festival, Infinity Beverages owner Matthew Rick will present “The Science of Winemaking & Distilling” on Nov. 5. The Wisconsin Science Festival (WSF) will take place during the first weekend of November, featuring eight fun Eau Claire events all specially designed to promote discovery in science, technology, engineering, art, and math (STEAM) in all age groups – yes, that means grown-ups, too. In 2009, the World Science Fair in New York and the construction of the Wisconsin Institute for Discovery – now often referred to as the Discovery Building – inspired Laura Heisler, director of programming at the Wisconsin Alumni Research Institute, and George Tzougros, executive director of the Wisconsin Arts Board, to spread the growing excitement about science to communities throughout Wisconsin. After two years of planning, they launched the first Wisconsin Science Festival alongside the grand opening of the Discovery Building. During its first year, the festival took place on the UW-Madison campus and at the Madison Children’s Museum, although Heisler and Tzougros had bigger plans, should the introduction prove successful. “If it didn’t work out, we could just slink away,” Heisler said. “But it wildly exceeded our expectations.” The Discovery Building was at capacity and participants battled Badgers football traffic to come learn about science. In year two, the organizers integrated children’s museums and libraries across the state, and the event has grown each year since then. This year will feature events hosted in more than 40 Wisconsin communities, including eight events in Eau Claire and several more in the surrounding area. In 2016, 34 communities hosted more than 285 events, drawing more than 30,000 participants across the state. The estimated economic impact is $750,000 to $1 million, according to Heisler. “We want people to understand that there’s something for every age group,” Heisler said of this year’s festival. The organizers challenged themselves to recruit 10 “Science on Tap,” events across the state to engage audiences beyond childhood. Two of those events are being hosted locally, at Infinity Beverages in Eau Claire and Modicum Brewery in Altoona. The events put on in association with the festival reflect the strengths of the community that hosts them, according to Heisler and Wesley Marner, outreach program and lab manager with the Morgridge Institute and fellow WSF organizer. Some communities focus more on agriculture, others on research or manufacturing. “There’s a different flavor everywhere you go,” Heisler said. Dr. Donn Dexter and Sara Sandager, a registered nurse, both of Mayo Clinic Health System, did outreach for the festival to invite local businesses to participate. The subjects at Eau Claire events range from astronomy at Beaver Creek Observatory to Yoga at the Eastridge Highland Fitness. It all starts on Thursday, Nov. 2, at the Wildlands Science Research School where families can discover project-based learning through a student fieldwork showcase. Later that night, Modicum Brewing will host an adults-only get-together where grown-ups will learn how to brew their own beer. UW-Eau Claire gets in on the action Friday evening to teach about the science of art and color with Tiit Raid, emeritus professor of art, at the Foster Gallery. Then, get an early start on Saturday, Nov. 4, to join Highland Fitness for The Science of Yoga. From 10 am to noon, the Eau Claire Children’s Museum will host “Gross-ology” – the science of bodily functions. Attendees may wander to various stations during the event to learn about digestion, the composition of blood, the respiratory system, wearing a helmet, and more. That evening, Hobbs Observatory astronomer Bert Moritz will discuss why the Milky Way doesn’t look like other galaxies from our perspective, how to get and stay in orbit, and “the moon illusion,” among other topics. This presentation will be a fun talk for adults and children second grade and up. Wind down Sunday with the science of food and more about libations! “It’s always extra fun to get a group of people together for an event like this that are eager to talk extra nerdy with us about wines and spirits,” Matthew Rick, who owns Infinity Beverages, said of the event at his winery and distillery. 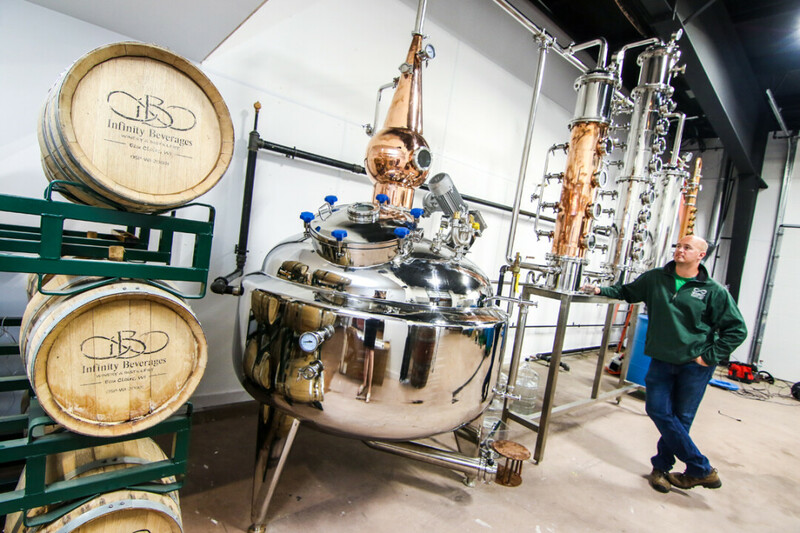 Adults can join them for a tour of the distilling operation and a glimpse into the scientific process of making wine and spirits. Reservations are required for this one, so plan ahead! Find the Hambulance parked outside Modicum Brewing at 6pm Sunday to learn about the science of barbecue and finish your scientific exploration with some tasty experiments. “We are striving to reach everybody to connect through science,” Heisler said. And the impact of the festival is widespread, with an event within an hour’s drive of every town in Wisconsin.